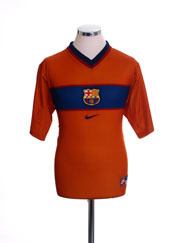 Barcelona Home voetbalshirt 1998 - 1999. So similar to the 98-99 shirt that I don't know why they bothered, they added a collar & changed the cuffs, took the word Barca off the left sleeve replacing it with the centenary roundel & the size logo that Nike had been putting on the outside of shirts disappeared. 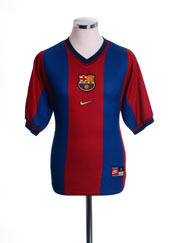 Relive Barcelona’s 1998/1999 La Liga season with this vintage Nike home football shirt. Available direct from Vintage Football Shirts for just £38.